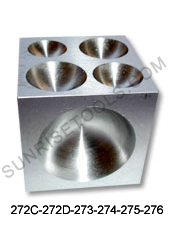 Description :- Dapping dies are made of solid tool steel and highly polished. Commonly used to make beads and shape metals. Dapping die and design block with 4 circular holes and 7 semi circular at edges. 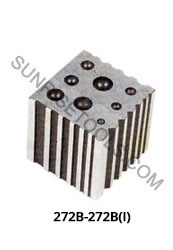 Size:- 2.1/2" X 2" X 1"
Description :- This dapping die is made from hardened tool steel and a great tool for making beads and shape metals. 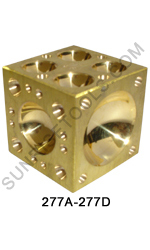 Size:- 4" x 2.1/2" X 1"
Description :- This block is made from high quality steel with a mirror polished finish and is used to shape metals. The other side is fully grounded which can be used as a bench block. 270 Flat dapping block with 27 depressions. 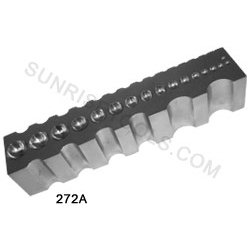 Size:- 5" x 2.1/2" x 3/4"
Size:- 2" x 2" X 3"
Description :- This Block is made of hardened tool steel and used in Bending, Grooving, Shaping, Creasing etc. 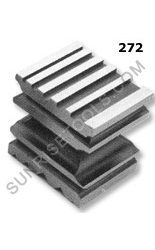 Size:- 2 " x 2.1/2" X 2.1/2"
Description :- This versatile and multipurpose Dapping Block is made of superior quality steel. Also great For Metalsmiths, Metal Working & Shaping Soft Metals & Waxes. 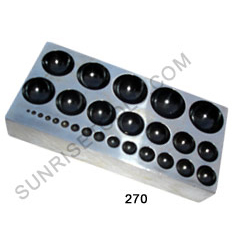 Description :- These Doming Blocks are available in Steel, Brass, Bronze and used to make beads and shape metals. 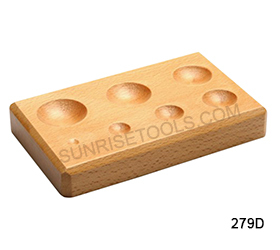 These doming block's depressions have smooth finish, made from Solid steel & last for a lifetime. 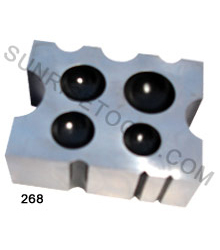 273 Doming block steel 2" x 2" x 2"
274 Doming block steel 2.1/2" x 2.1/2" x 2.1/2"
275 Doming block steel 3"x 3"x 3"
276 Doming block steel 4"x 4"x 4"
277A Doming block brass 1"
277B Doming block brass 1.1/4"
277C Doming block brass 1. 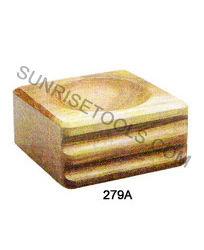 1/2"
277D Doming block brass 2"
Description :- This Wooden Doming Block comes with two wooden and used for shaping cases, removing dents, crafting and jewelry making. Wooden block saves precious metals from scratch or mar. 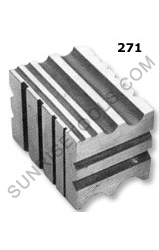 Description :- This large block features depression on both flat surfaces and u-channel grooves along the length of two sides. 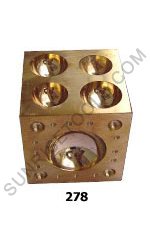 This substantial block will hold up to heavy gauge metals without risk of marring the metal. Description :- This can be used for forming and doming sheet metal, removing dents and shaping cases. The wood pieces will not scratch or mar precious metals. The block features depressions on each side in different sizes. 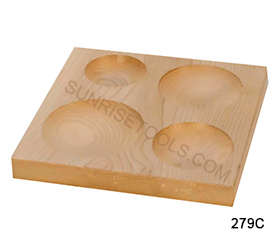 Description :- Made of polished special wood, this has large dapping four shallow round which give deep depressions. Use it with a suitable wood, nylon or leather mallet as a non-marring dapping surface for soft non-ferrous metals like copper, gold and silver. The diameters of the round depressions are 2-1/2", 3". 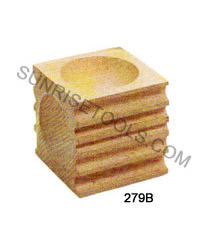 3-1/2" and 4"
Description :- Made of polished special wood, this round shallow depression dapping block has 7 different rounds from 1/2" (13mm) to 1-1/2" (37mm). Use it with non-marring tools like wood, nylon or leather mallets and you won't scratch soft non-ferrous metals like copper, brass, gold and silver. 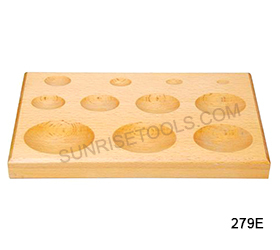 Description :- This is special wood made dapping block with 11 different size ROUND shallow depression shaped cavities; the wooden material will allow you to shape your metals without marring. 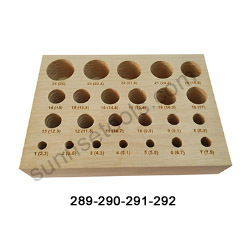 Wooden forming block used in jewelry metal forming designing and dapping, this sturdy forming block has seven different size depressions. 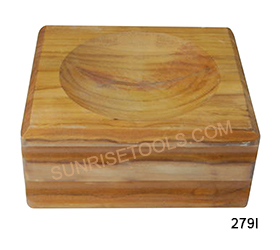 Description :- Made of polished special wood, this OVAL shaped shallow depression dapping block has 7 different oval shapes. Use it with non-marring tools like wood, nylon or leather mallets and you won't scratch soft non-ferrous metals like copper, brass, gold and silver. This is easy to carry with you. 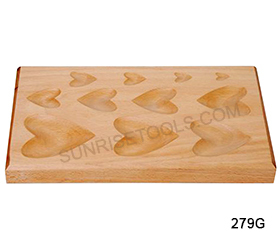 Description :- Made of polished special wood with 11 different sized heart shaped cavities the wooden material will allow you to shape your metals. 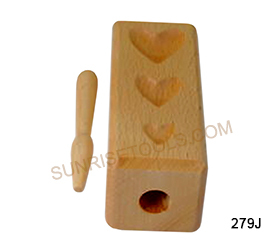 This block prevent scratching or marring, Wooden Heart shape forming block used in jewelry metal forming designing and dapping, this sturdy forming block has eleven different size depressions. 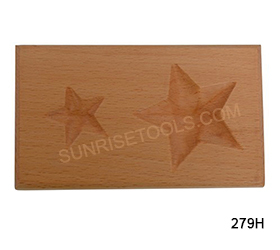 Description :- This large wood dapping block has two Large depressions. And Use it with non-marring tools like wood, nylon or leather mallets and you won't scratch soft non-ferrous metals like copper, brass, gold and silver. This is easy to carry and hardwood useful to compare any solid metal. 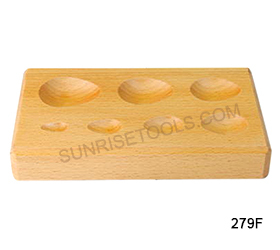 Description :- Wooden Dapping Block Punch Set will be perfect for shaping any piece of jewelry. This has four shapes with three of each surface that vary in sizes. 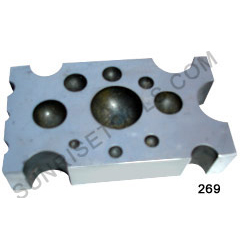 This Multipurpose Block is very useful to jewelers also has dapping punch to complete work. 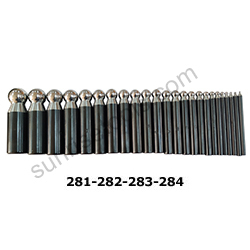 Description :- These Doming punches are made from hardened steel and are used in conjunction with a doming block to make spheres or hemispheres out of sheets of metal. 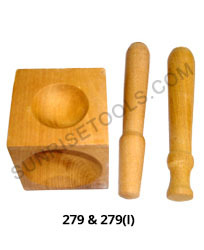 Description :- Polished and anodized steel dapping punch set on wooden stand. 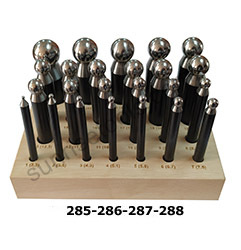 Each punch fits in a pre-drilled hole clearly marked with size of corresponding punch.